Reinforced Spoke Nodes feature localised materials to strengthen the rim. 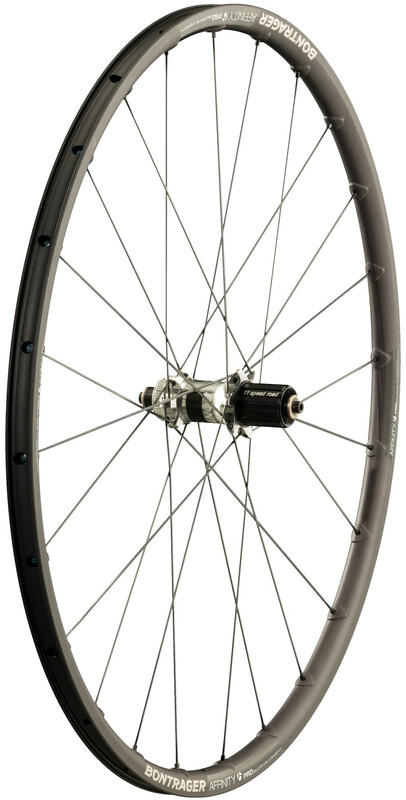 Stacked lacing alignment provides a better spoke bracing angle for a stiffer wheel. Tubeless Ready (TLR) rims allow for quick transition to a tubeless system. The offset spoke bed reduces wheel dish for a stiff and stable performance. Interchangeable axles are available to adapt to thru-axle forks and frames. A lightweight alloy rim (23 mm outer, 17.5 mm inner width) and DT Swiss hubs. Compatible with Shimano 10/11-speed, SRAM 10/11, CenterLock freehubs. Includes Bontrager T LR rim strip, TLR valve stem, 5 mm end caps and QR skewer.